1. Preheat the oven to 180°C, gas mark 4. Break the chocolate into pieces and melt with the butter in a small bowl in the microwave or over a pan of simmering water. Set aside to cool slightly. 2. In a medium saucepan heat the sugar with the maple syrup over a low heat for 5 minutes, or until the sugar has dissolved. 3. In a large bowl, beat the eggs. Whisk in the cooled chocolate mixture, then add the sugar syrup and continue whisking to combine thoroughly. Stir in the pecans, vanilla and sea salt. Set aside to cool completely. 4. Place the pastry cases onto 2 large baking trays. Divide the pecan filling between them. Bake for 15-20 minutes, or until the filling is set, swapping the trays over towards the end of cooking. 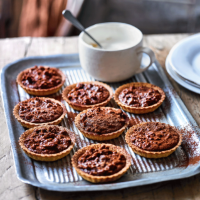 Meanwhile, whip the cream with the maple syrup to soft peaks, dust with cocoa powder, and serve with the warm tarts.